Michael Dunlop has signed to ride for the Bennetts Suzuki team at the international road races in 2017. 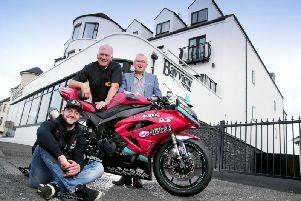 Isle of Man TT outright lap record holder Michael Dunlop has signed with the Bennetts Suzuki team to ride the all-new GSX-R1000 on the roads in 2017. The Ballymoney star has ended months of speculation over his choice of machinery, with uncertainty lingering over his plans after Hawk Racing’s Stuart and Steve Hicken switched manufacturer from BMW to front Suzuki’s official effort in this year’s MCE British Superbike Championship. Dunlop has excelled on the German-built S1000RR in recent seasons, clinching Superbike and Senior doubles at the Isle of Man TT in 2014 and 2016 along with Superbike victories at the North West 200. The 27-year-old became the first rider in history to complete a sub 17-minute lap of the 37.73-mile Mountain Course last year in the Superbike race before shattering the outright lap record, clocking a staggering speed of 133.962mph on his way to his 13th career TT triumph in the blue riband Senior. Dunlop and BMW have proven a formidable force, but the ‘Maverick’ has opted to put his faith in Suzuki’s new GSX-R, which has received rave reviews in the specialist biking press. Dunlop said: “I was chatting with Steve [Hicken - team manager] for a while, and obviously we’ve worked together a lot before. With the new bike coming it’s been a bit different and we had to gather up exactly what was happening. “We just needed to see what was going to be able to happen and to see where we were both going to be at this time. “I know Steve and I know Stuart though, as people, and I know they can take a new bike and get it right,” he added. Team manager Stuart Hicken says he believes Dunlop is the man to make the new GSX-R into a winner on the roads from the off. “We’ve known Michael for a long time and always wanted to work with him again this year, so we’re really pleased we’ve been able to put a deal together,” he said. “We’ve made good progress already with the development of the new GSX-R1000, and we know the potential is there with the bike. The change of manufacturer will evoke memories of his short-lived association with Shaun Muir’s Milwaukee Yamaha squad in 2015, when Dunlop controversially split from the team during practice week at the TT and renewed his ties with the Hickens’ Hawk Racing concern to ride a BMW again. However, Dunlop is confident history won’t repeat itself as he prepares to take on the challenge of firing Suzuki back to the top of the TT rostrum for the first time since Aussie Cameron Donald won the Superbike race in 2008 for TAS Racing.